Pet urine can cause permanent damage to your floors and rugs. Pet odor can also create an unhealthy indoor environment. 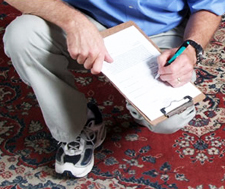 When urine is first deposited onto a carpet or rug, it has a pH of 5 or 6, which is on the acid side of the pH scale. Stain -In the original acid state, the urine begins to oxidize and react with the carpet to create a color change, also known as urine stain. As time passes, the pet stain will become increasingly more difficult to remove, depending upon the carpet. 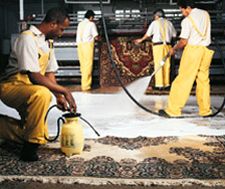 The dye structure of the carpet may sustain permanent damage. Bear in mind that over-the-counter products (i.e. Resolve, Oxyclean, etc.) may set the stain. We recommend none of these. The primary source of odor associated with urine comes from bacteria that grow abundantly in dark and warm places with a never ending food source. This bacteria growth and breakdown of the urine creates amino acids. These complex organic compounds will often work deep into the fibers until they actually become part of the fibers. At this point the odors are very difficult to remove. The waste materials and gases from the decomposing urine create an unpleasant odor. When dried urine is remoistened it gives off an ammonia gas which is extremely unpleasant. Urine odor, if it has become dormant, will sometimes “come alive” on days of high humidity. The salts and crystals that are left behind as the urine dries are hydrophilic and draw water to them. Dried urine “comes alive” during humid months because the salts are attracting moisture, and when the moisture evaporates the ammonia gas is released to the air. This is why cleaning existing urine stains may not completely remove any associated odor. In fact, it could increase the odor in the environment temporarily. 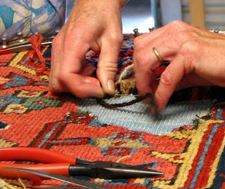 Rug Pet Stain and Odor Removal – Things you should know before cleaning your expensive rug. 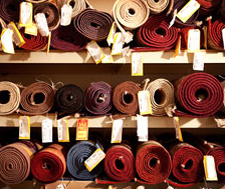 A rug can have many different types of stains, structural damages, and color run. For every type of problem there is a unique approach and intervention. Pet stains are very common and can cause permanent damage to the rug and a serious health hazard. Unfortunately, urine deposited on fibers of the rug does not stay there. It penetrates the fibers and contaminates the flooring material below the rug. Urine odors will also permeate to the floor; be it stone or wood. As the urine dries, the liquid evaporates but the urine crystals, which consist of bacteria, urochrome, uric acid, urea, proteins, hormones, and other ingredients, become even concentrated and pungent. Simple cleaning will not remove this odor. Commonly used disinfectants and perfumes will not remove the odor. Pet urine needs to be properly released and removed. A simple wash will not get rid of pet stain and, the urine crystals will continue to cause structural damages to your rug. Commonly used over powering perfumes and/or skunk perfume is a sign of improper wash and the problem continues to exist. Pet odors will completely disappear when the pet urine is properly released and removed. Trust Our expertise and experience – Get the pet stain removed properly! Immediately contact us so we can guide you to minimize the damage and schedule a pick-up. Remember the longer you wait the more chances for the pet stain to set and cause permanent color damage. If the urine remains in the wool, it can cause color run, burn/decompose and destroy the rug and require expensive repair. 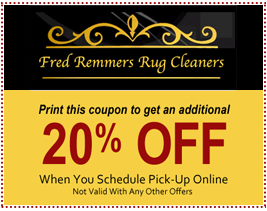 Here at Fred Remmers, we know rugs, and we specialize in rug cleaning and repair.